← New York Wine Diary: Day 4 – Welcome to Urban Wine Life at “Château Lüttmer” in Berlin! 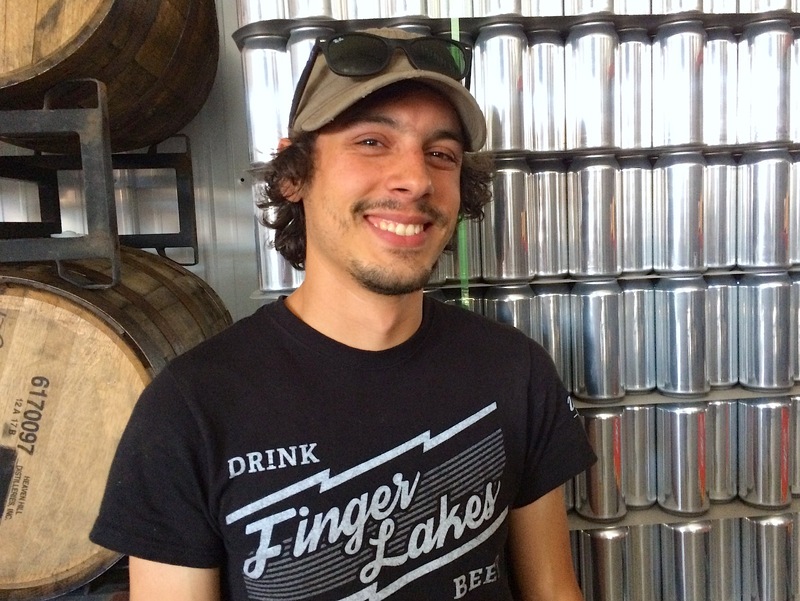 No doubt you’re wondering what Tony Cardova, brewmaster for the War Horse Brewing Company belonging to the Three Brothers winery in Geneva in the FLX (Finger Lakes in Upstate New York) is doing pictured at the top of a Riesling story on this wine blog? Well, amongst other beers, Tony brews a Riesling wheat beer and a Riesling sour beer, and these were amongst the many new products I tasted during the Finger Lakes Wine Alliance trade presentation of the 2015 Rieslings when I was up in the region during the last days. The fine weather meant that the wine presentation could take place in the garden that separates the various buildings that make up the Three Brothers complex (there aren’t actually three brothers, rather three wine brands each with a strikingly different marketing concept and its own space). However, I had to go into the bar of the brewers to taste those beers. Good as the Riesling wheat beer is, with a somewhat more fruity citric taste than is normal for this category, it was the Tarty McFly Riesling sour beer that got me, because it has a crispness genuinely reminiscent of Riesling wines. So beer and wine can share some common ground, in spite of all the important differences between them. The wine tasting was important because it was the first time that I’ve been able to sample a bunch of FLX Rieslings of the new vintage from different producers next to each other. Undeniably, some of the best wines (Boundary Breaks and Sheldrake Point, both of whom haven’t released any 2015 Rieslings yet) were rather closed, because they were bottled just a couple of weeks ago. However, the overall conclusion was very clear: the best 2015s are the most exciting FLX Rieslings made this century, and that in spite of the tough competition from the best 2014s! In fact, one of the innovative wines at the event was the 2014 Riesling (medium-dry) from Bellangelo that has only just been released. Making wines like this that need this kind of maturation before release is a new idea in the FLX and I feel sure that this is an important new development. In this case it enabled quite a strident acidity and a flinty-funky note from extended lees contact to become well integrated, and a serious aromatic and textural complexity to develop. At the front of the pack of 2015s I tasted was the Dry Riesling from Dr. Konstantin Frank, the founder of the vinifera wine industry in the region and in the Eastern Seaboard states. This has really intense floral and herbal aromas that literally leap out of the glass at you, and for all its power the wine remains as sleek and sinewy as a marathon runner. The acidity is energizing, but far from sharp. Anyone who doesn’t yet know what the mineral aspect of Riesling tastes like is directed to this wine! It has all the virtues of the 2015 vintage in the FLX with none of the down sides. They resulted from the wet early summer when Botrytis (in this case ignoble rot) from getting an early foothold on the grapes in some vineyards. That either resulted in full-blown rot later in the summer or the imminent threat of rot forced an early harvest before the grapes had achieved full ripeness. The big surprise of the tasting was the new wines from Lakewood Vineyards on the west side of Seneca Lake. These have long been good wines, but since Ben Stamp joined his father Chris in the cellar they took a jump up. “I like wines that teeter on the edge, wines with tension,” Ben told me, and that is an excellent description of the winery’s 2015s. They also have the ripe passion fruit, peach and citrus aromas that are typical of the vintage. It’s a little known fact that Three Brothers produce almost 120,000 bottles of Riesling per year and are therefore one of the major players in the FLX with this variety. They have a simple, but radical marketing concept for these wines which is directly linked to the IRF (International Riesling Foundation) taste profile on the back label of each wine. It divides the Riesling taste-spectrum into four bands: dry / medium-dry / medium-sweet / sweet. The Three Brothers 0 Degree Riesling is dry, the 1 Degree Riesling is medium-dry, the 2 Degree Riesling is medium-sweet and the 3 Degree Riesling is sweet. They are all unashamedly fruit-driven wines and the 2015s are very clean with a lot of charm. 2015 is a vintage with which the FLX is going to win friends and influence people, also NYC, DC and beyond! Watch this space for more information as more wines are released. This entry was posted in FLXtra, Home, ROCK STARS OF WINE AMERICA. Bookmark the permalink. It was a pleasure meeting you Stuart, thanks again!